New Eagle Scout Louie Harris with (left to right) brother and fellow Eagle Scout John, and parents Diane and Robert. 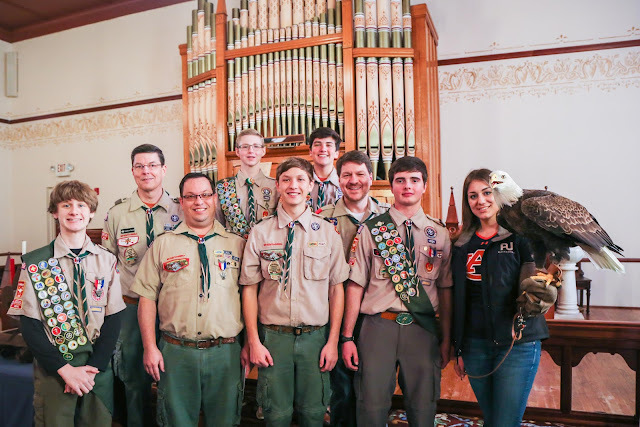 On Saturday, Jan. 20, Troop 50 bestowed the Boy Scouts of America’s highest rank during a ceremony honoring new Eagle Scout Robert Louis “Louie” Suess Harris. Louie appeared before the Saugahatchee District’s Eagle Scout Board on Aug. 15, 2017. 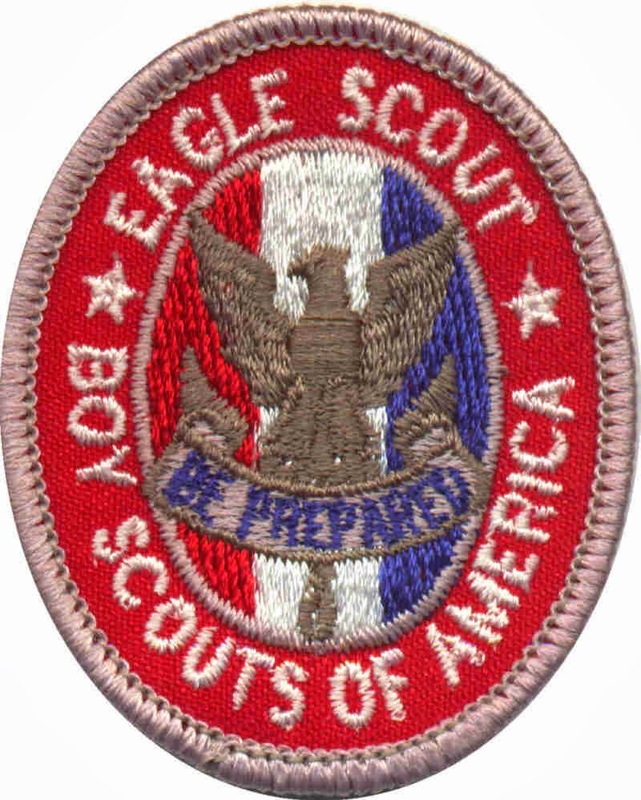 He is among the four Troop 50 Scouts to earn the Eagle Scout rank in 2017, and the 16 Scouts to earn the Eagle Scout rank since the troop’s founding in 2012. Senior Patrol Leader Rusty calls the court of honor to order. Louie’s ceremony, held at the Founder's Chapel of Auburn United Methodist Church, included many of his fellow Scouts with whom he has served in leadership positions since joining the troop in 2013 after earning Cub Scouting’s Arrow of Light. As a founding member of the troop, he has served in leadership positions that have included patrol leader and assistant patrol leader, troop guide, instructor, senior patrol leader and assistant senior patrol leader, and his current role as junior assistant scoutmaster. 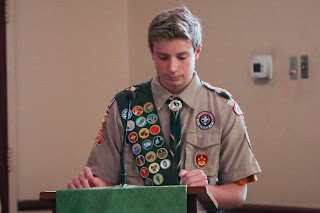 The ceremony began with the traditional flag presentation (accompanied by a bugle call) and an opening prayer, followed by a ceremonial candle lighting by his fellow troop members, and welcomes from Scoutmaster Andrew Baird and Saugahatchee District representative Julie Hoff. The reading by Assistant Scoutmaster Wes Williams of “100 Scouts” provided a poignant segue to a motivational speech by Will Herring. Herring, an Opelika native and friend of the Harris family, was an Auburn University football standout before an NFL career that included playing with the Seattle Seahawks, New Orleans Saints and St. Louis Rams. 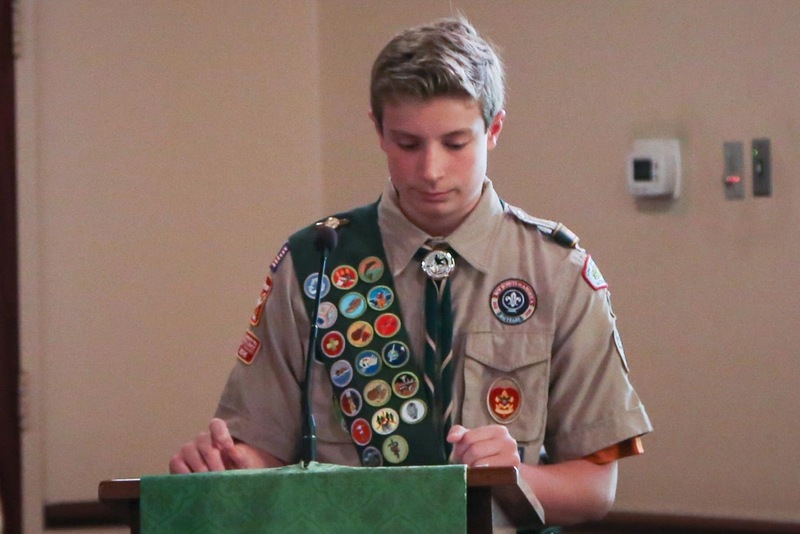 He challenged Scouts and others in attendance to find something about which they can be passionate, and to devote their efforts on pursuing that passion and developing a strong work ethic. Louie's mother pins his Eagle Scout medal to his uniform. 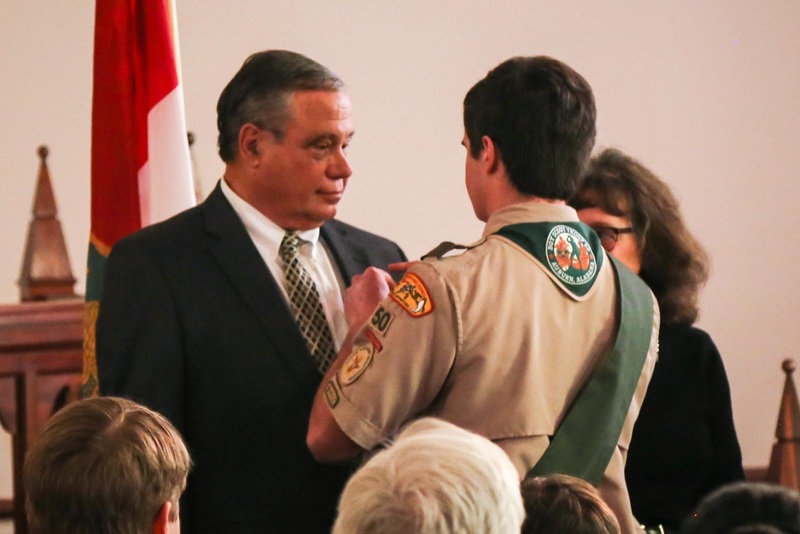 Louie pins a father's Eagle Scout recognition pin on his father. 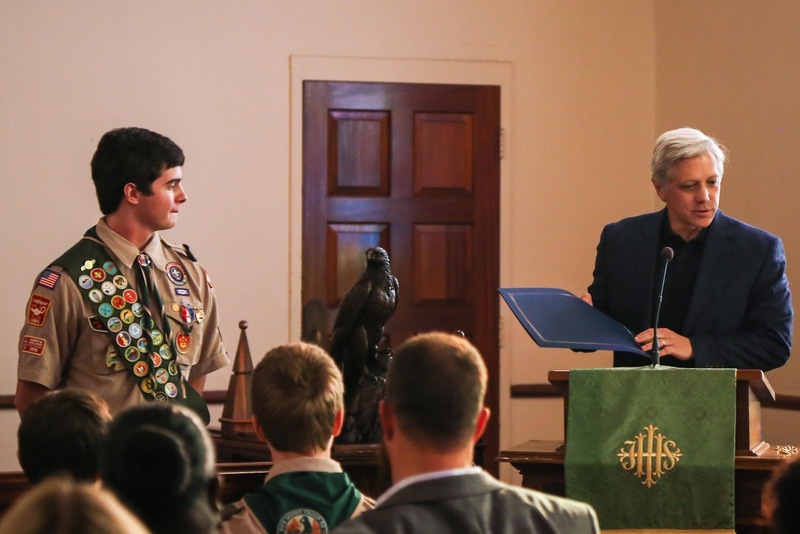 As part of presenting Louie with the Eagle Scout rank recognitions, fellow Scouts outlined the challenge of being an Eagle Scout, and Scoutmaster Baird administered the official Eagle Scout Charge and Promise. 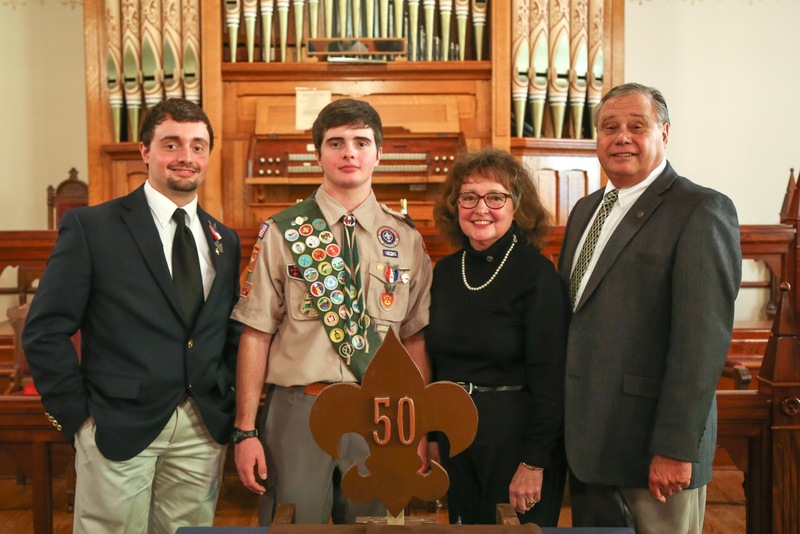 His mother, Diane, presented him with his Eagle Scout medal, and father Robert and brother (and fellow Eagle Scout) John presented him with an Eagle Scout neckerchief slide. Because Louie had earned 26 merit badges at the time of his ceremony, he qualified for a bronze Eagle palm. proclamation from the City of Auburn. 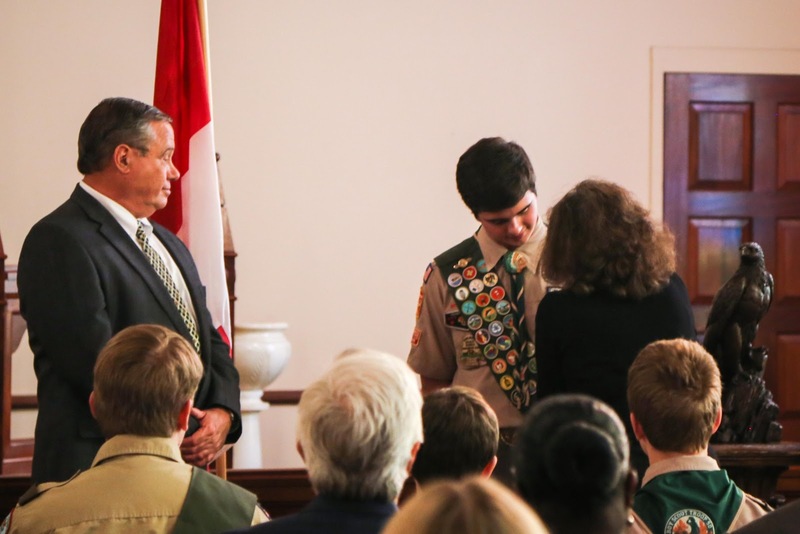 Following the presentation of his rank insignia and Eagle Scout mother and father pins to his parents, Louie also received membership in the National Eagle Scout Association as a gift from the troop. In addition to these recognitions, City of Auburn Mayor Pro Tem Ron Anders presented Louie with a proclamation declaring Jan. 20, 2018, as “Louie Harris Eagle Scout Day” in Auburn. In concluding the ceremony, Louie expressed appreciation to those who had played roles in his development, education and advancement in Scouts. He honored several special individuals by presenting them with Eagle Scout mentor pins. Those included Scoutmaster Andrew Baird, Assistant Scoutmasters Wes Williams and JP Pendleton, Chartered Organization Representative Michael Tullier, Troop Committee Chair Rob Stanford, his brother John Harris, Kreher Forest Ecology Preserve Outreach Administrator Jennifer Lolley (who supported his Eagle Scout leadership service project benefiting the Forest Ecology Preserve), and family friends Jack Robertson and Gaines Lanier, both of whom shared valuable cattle management and life skills with him. 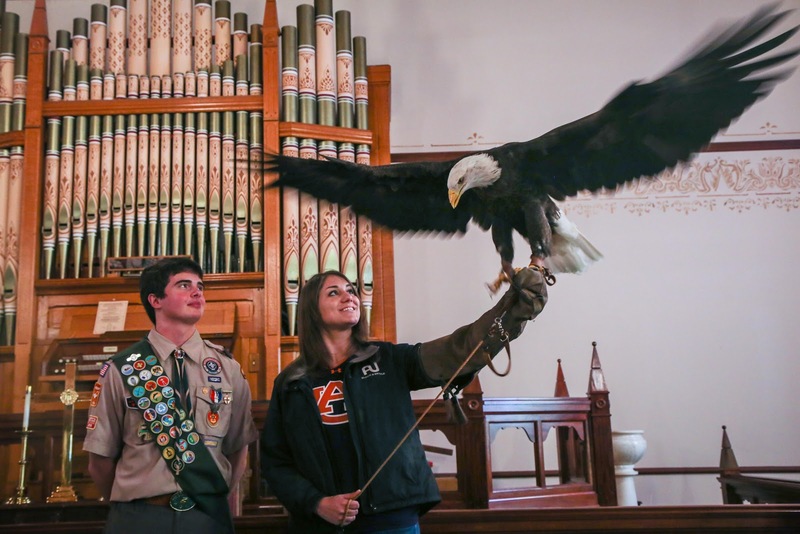 New Eagle Scout Louie Harris with Spirit, Auburn University's bald eagle, and other Troop 50 Eagle Scouts. The Harris family arranged for a special guest to be present following the court of honor. Spirit, the only bald eagle that has ever flown in Jordan-Hare Stadium, made an appearance at the ceremony. Now under the care of the Southeastern Raptor Center, Spirit was discovered as an injured fledgling in Florida in 1995 and came to Auburn in 1998 to join the Raptor Center’s educational collection. His damaged beak makes him non-releasable. Spirit’s first pre-game flight in Jordan-Hare Stadium was in 2001. Bald eagles like Spirit are found throughout Alabama, and wild ones can sometimes be seen soaring in the skies above Auburn. 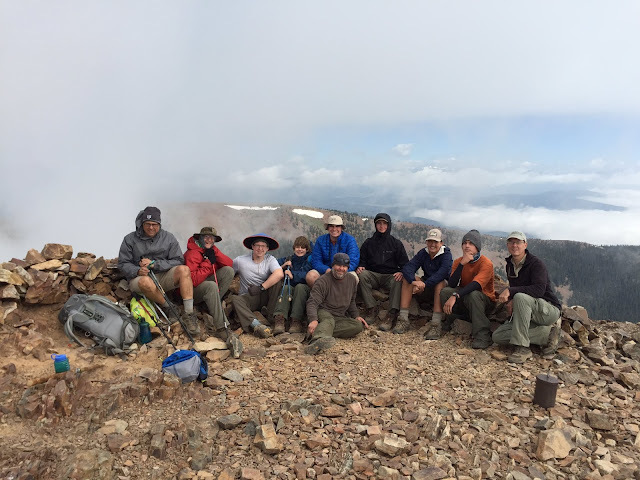 Louie (black hoodie) and the rest of Expedition 620-B atop Philmont's Mt. Baldy in June 2017. To date, Louie’s Scouting participation has included accruing 81 nights of camping, 130 hours of community service, and 81 hiking and backpacking miles. He received the troop’s 2016 James J. Baird Jr. Honor Scout Award, earned the BSA Mile Swim Award, and was inducted into the Order of the Arrow, Scouting’s national honor society. In addition, he completed the Boy Scouts’ National Youth LeadershipTraining, a six-day course equipping Scouts with leadership skills and experience applicable to both Scouting and personal situations. Among his other Scouting activities is participating in a 12-day backpacking expedition at Philmont Scout Ranch, the Boy Scouts’ largest national high-adventure base located in Cimarron, New Mexico, in June 2017. The finished product of Louie's Eagle Scout leadership service project at the Kreher Forest Ecology Preserve. 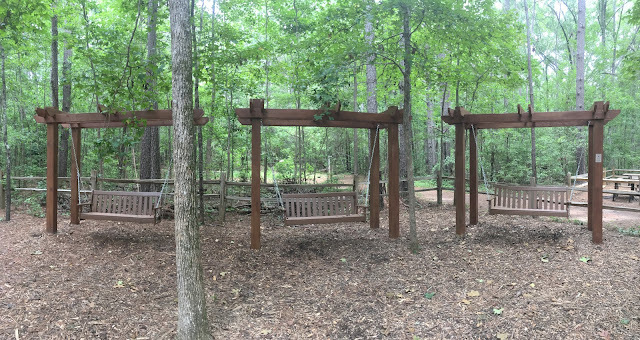 For his Eagle Scout leadership service project, Louie and volunteers constructed three arbor swings for the nature playground at the Kreher Forest Ecology Preserve in Auburn. These swings provide a place for parents and visitors to sit and relax comfortably while watching their children play. His project accrued 353 volunteer hours from planning to completion, including the 84 hours he spent personally planning, leading and supervising the various stages of the project. 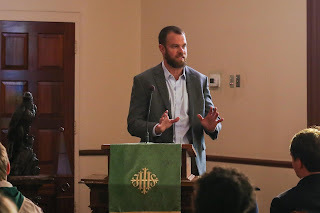 Louie received contributions and support for the project from an Auburn University Concession Board grant, the Louise Kreher Forest Ecology Preserve, the Lee County Soil and Water Conservation Committee, Russell Building Supply, Garden of Eden Landscaping, and family and friends. Outside of his Scouting involvement, Louie currently is a 10th grader at Auburn High School, where he plays trombone in the symphonic band and is a member of the Junior Honor Society. He and his family attend Opelika United Methodist Church. 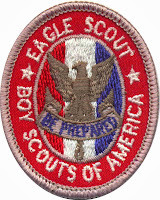 Since the first Eagle Scout was awarded in 1912, more than 2.4 million Boy Scouts have completed the Eagle Scout’s performance-based rank requirements, which currently include serving in progressive leadership positions, demonstrating outdoor and Scouting skill competencies, earning at least 21 merit badges, and planning and executing a seminal Eagle Scout leadership service project. During 2016 alone, 55,186 Boy Scouts earned Scouting’s highest rank. 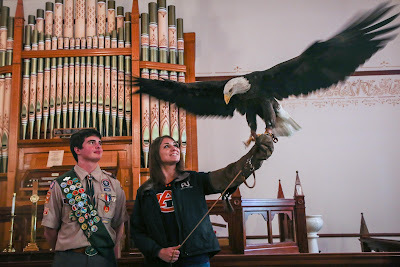 For more photos from Louie’s Eagle Scout Court of Honor and Eagle Scout leadership service project, visit the troop’s online photo album.